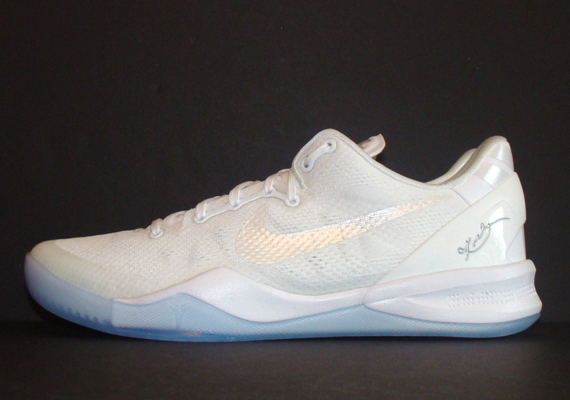 The Kobe 8 is out of here, as Nike Basketball is now focused on bringing you the various Nike Kobe 9 styles. But we’re still spotting stray pairs from the sneaker’s legacy here and there, like this curious promo sample. The pair looks rather like a NIKEiD creation and is stamped with a curious “Last Chapter” message on the inside of the tongues, which definitely feels like an illusion to Kobe’s being in the twilight years of his NBA career. Take a look at this gleaming white, icy sole pair that’s apparently just one of fifty made, and then bid on them yourself from dballaholic on eBay.